Editor's note: The emerald ash borer was discovered in Maine at the end of May 2018. The borer is native to northeastern Asia, first turning up in the U.S. in 2002, near Detroit, Michigan. A short while later an infestation was found in Canada, right across the Detroit River in Windsor, Ontario. How the borer got to North America remains a mystery. Foresters think it probably hitched a ride from Asia on ash wood pallets or other wood packing materials loaded onto cargo ships or planes. And it has killed millions of ash trees in its path. On Feb. 27, the number of U.S. states the borer had already infested became 32 with the discovery of an infestation in Vermont. In Canada, it has spread to three provinces, including Quebec, where borer populations have been found in Quebec City and in Sherbrooke, near the northern Maine border. To slow the spread of the insect, Canada has quarantined a vast area of forestland. On Jan. 24, the Canadian Food Inspection Agency expanded that quarantine all the way to the border of three Maine counties: Oxford, Franklin and Somerset. The quarantine bans the movement of ash throughout the affected area. “Things like nursery stock, logs, branches and wood chips and all species of firewood,” says Ron Neville, a plant health survey biologist with the Canadian agency. The ravenous borer is also encroaching on Maine from the south. Infestations found in New Hampshire in 2013 have since spread in that state to about 10 miles from the southern Maine town of Lebanon, in York County. New Hampshire has also imposed a quarantine extending to Maine’s border. So far, such quarantines have failed to halt the emerald ash borer’s destructive rampage, says Maine Forest Service Entomologist Colleen Teerling, who has been on the front lines of the battle to keep the borer out of Maine. She says the question is not if, but when, that battle will be lost. “We’re guaranteed to get it in Lebanon within a few years, just from natural spread,” Teerling says. Despite that, inaction is not an option, she says. The nation's ash trees are valued at more than $300 billion, according to 2013 estimates by the U.S. Department of Agriculture. Those figures show that Maine, one of the most heavily forested states in the nation, is among the top six states for ash trees. About 4 percent of the hardwood trees growing on Maine’s approximately 20 million acres of forestland, Teerling says, are three species of ash: white; green or red; and black or brown. Ash is a hard, tough wood. White ash is used to make boat oars and paddles, baseball bats, hockey sticks, tool handles, farm implements, snowshoes and other items that typically take a beating. Green, or red, ash has lined many American streets and boulevards, particularly in the Midwest, since the 1950s and ’60s, when they were planted to replace elm trees wiped out by a beetle-spread fungus called Dutch elm disease. Green ash’s seed pods provide food for turkeys, bears, small rodents and other critters. Black, or brown, ash is prized for its strong, flexible fiber. For untold generations, the Wabanaki people, the first settlers of what is now Maine, have been harvesting and processing the fiber and weaving it into baskets for fishing, food collecting and other uses. Today, their intricate baskets are sought by collectors as works of art. For members of the region’s Wabanaki tribes, which include the Penobscot and Passamaquoddy tribes and local Mi’kmaqs and Maliseets, the potential loss of black ash is unthinkable. It’s not only the origin of fiber for their world famous handwoven baskets but, tradition holds, of the tribes themselves. “When I heard about it, I was very much concerned,” says Passamaquoddy basket maker Gabriel Frey. Frey says hundreds of tribal members know how to make traditional Wabanaki baskets, and about 100 of them now rely on income from the craft. The industry contributes about $150,000 to the tribes’ economies, according to a 2009 University of Maine study — but Frey says there’s more at stake than money. “The Wabanaki creation story is tied to the black ash tree,” he says. In one version of that story, passed down for thousands of years, Wabanaki heroic figure Gluskap shot an arrow into a black ash tree and, from the split the blow created, humans emerged. But that won’t be easy. The Wabanaki have been honing the craft of making baskets out of black ash for countless generations. Frey says he learned the entire process, from harvesting the trees to weaving the fiber, from his grandfather. It’s not easy to find basketworthy black ash in the Maine woods — it makes up only 2 percent of trees, and few of those are suitable for basket-making fiber. Because machinery can damage those fibers, Frey cuts the ash down by hand. He hoists the logs over his shoulder and lugs them out of the woods on foot. Then the pounding begins, over every inch of the log. That loosens the fiber, and it can be stripped off, split thin and cut to width for baskets. 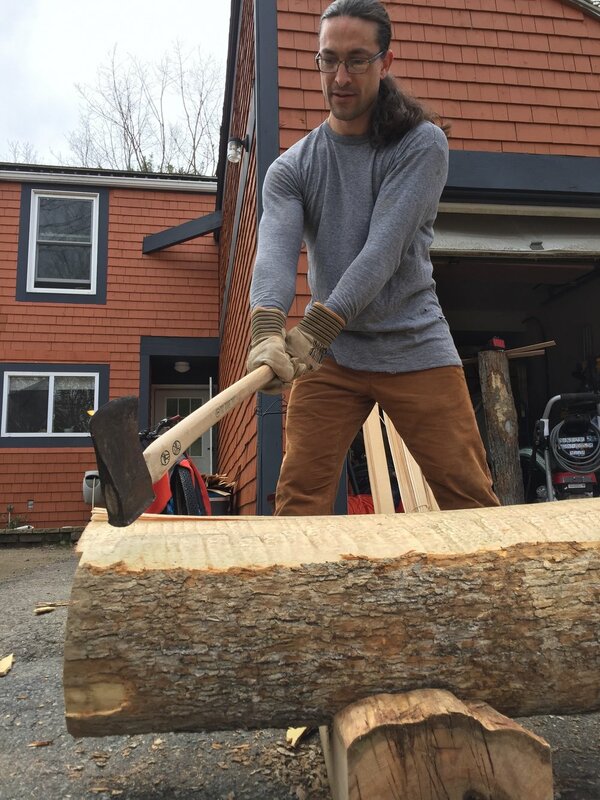 There’s a lot more to the craft, but Frey won’t reveal all the secrets of the “Passamaquoddy way,” techniques refined and passed down for thousands of years, binding the generations. But he says he’s resolved to the idea that it’s only a matter of time before the emerald ash borer breaches Maine’s defenses, and puts the existence of black ash in jeopardy. In 2010, Maine banned imports of firewood, a common way of spreading the emerald ash borer. So far, the bug hasn’t been spotted in Maine, but that doesn’t mean it isn’t here. While they have been monitoring for it, Maine entomologists say it’s easy to miss in the vastness of Maine’s forests. One thing to look for, Teerling says, is woodpeckers hammering on ash bark, which could be a sign that emerald ash borer larvae are inside the tree. Another sign is “blonding” — as birds peck away at the dark outer bark, more of the lighter bark beneath shows, giving the tree a “blond” look. Teerling says in climates such as Maine’s, the larvae grow in the tree for two years. Then, in June, the shiny, green adults emerge. Identifying an emerald ash borer is tricky — lots of bugs look similar. 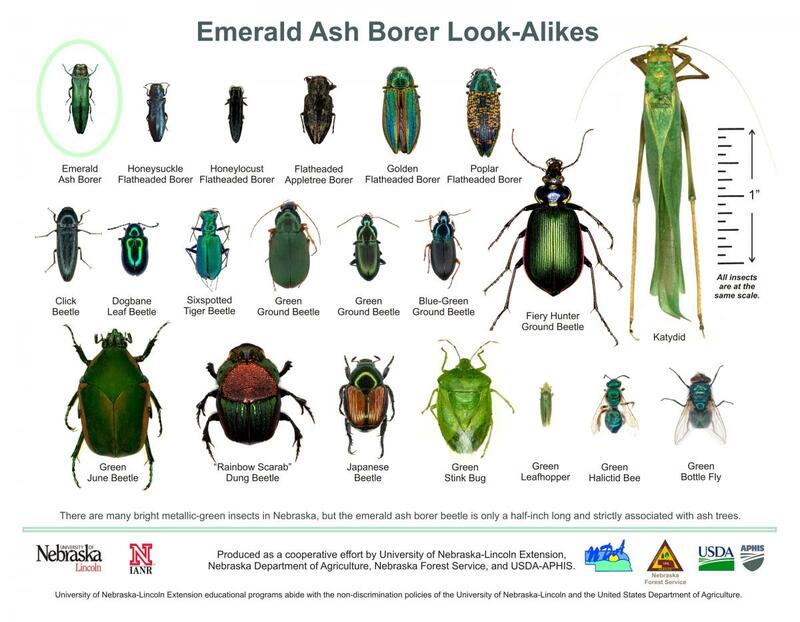 To help, the Maine Forest Service points to a graphic that compares the borer with lookalikes. “When it gets to Maine, the sooner we can identify it, certainly the better off we are,” she says. Struble says anyone who sees what they think are signs of the borer, even if they’re not sure, should call the Maine Forest Service. Meanwhile, the Maine Forest Service is assembling an arsenal of weapons to battle the pest over the long term. Among them are tiny wasps that feed on emerald ash borer eggs or larvae. The wasp helps keep the bug in check in Asia, where it evolved with the borer and where ash trees have also evolved to survive the insect. In the U.S., Teerling says, efforts are underway to develop strains of ash that can fend off the bug. But all of the species now growing in the Maine woods are completely defenseless. For Struble, the impending loss of Maine’s ash trees is personally painful. No one knows what will replace them, but foresters say it’s likely to be invasive tree species, some of which could pose environmental threats. For Struble, one thing is certain: The Maine woods won't be the same when the ash is gone.